You can use PROC NETDRAW to determine node placement and arc routing for any network depicting a set of nodes connected by arcs. If you want the procedure to determine the node placement, the network must be acyclic. This example illustrates the use of PROC NETDRAW to draw two networks that represent different schematic flows. The first network does not contain any cycles, while the second one has one cycle; to draw the second network, you need to use the BREAKCYCLE option. 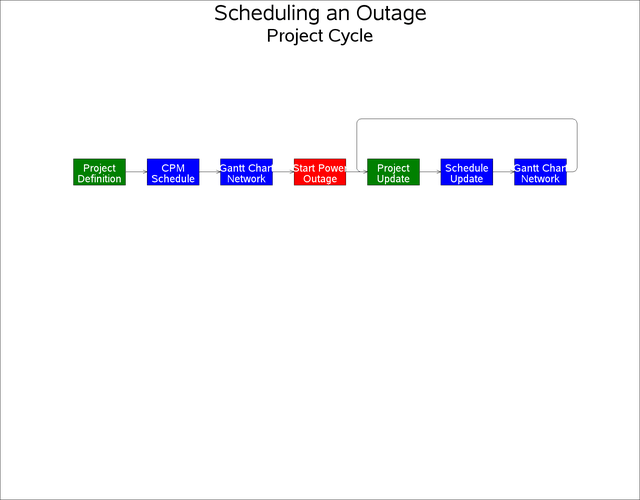 First, a schematic representation of the data flow going in and out of the three procedures (CPM, GANTT, and NETDRAW) is drawn using PROC NETDRAW. 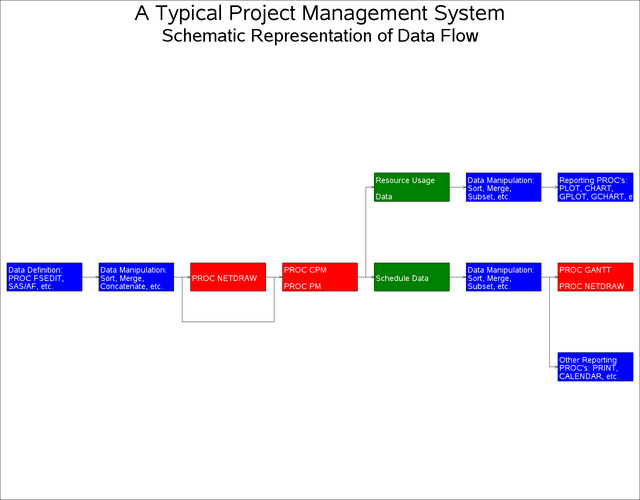 (See Chapter 3: Introduction to Project Management, for a detailed discussion of such a data flow.) The PATTERN= option is used to specify the variable in the data set that identifies the color that is to be used for each node. Nodes representing SAS/OR procedures are colored red, the ones representing output data sets are colored green, and all other nodes (representing the use of other parts of the SAS System) are colored blue. Three ID variables are used to specify the text that is to be placed within each node. The flow diagram is shown in Output 9.12.1. In this example, the data set OUTAGE contains the network representation. The variable style is used to color nodes appropriately. The resulting diagram is shown in Output 9.12.2.